It’s survive and advance season. And Tennessee did just that on Friday. The No. 2 seed Vols (30-5) barely brushed by No. 15 seed Colgate (24-11) in the first round of the NCAA Tournament on Friday afternoon, prevailing by a score of 77-70. Tennessee had a 16-point lead with 2:48 to go in the first half, and they led by 12 at halftime over the Raiders, but Colgate erased that quickly in the second half and grabbed a 52-50 lead in the first nine minutes of the second half. At that point, the Vols had gone cold on offense, and their defense was lagging as well. 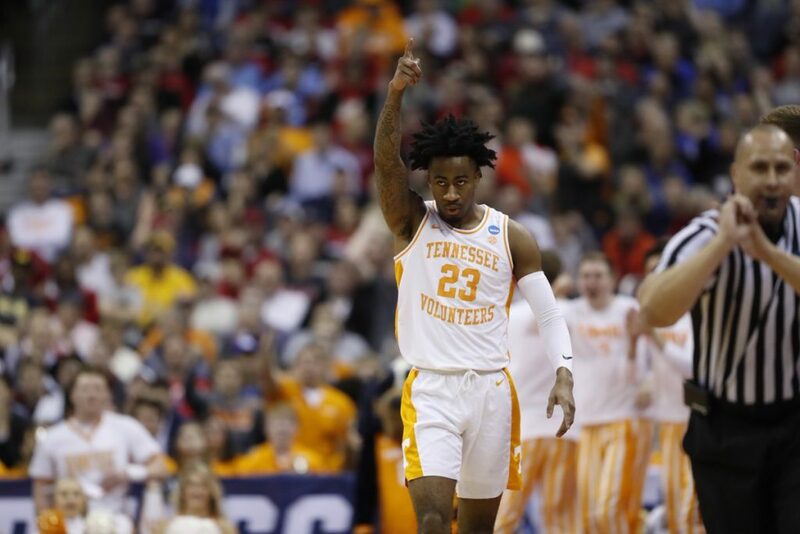 But after the media timeout with over 10 minutes to go, Tennessee settled down and finally started playing their game and pulled out an ugly win. Admiral Schofield nailed two clutch threes in the final minute, and both Jordan Bowden and Jordan Bone were solid contributors on offense. Those three stepped up as Grant Williams was bottled up. Things started out well for the Vols, and it looked like they might be able to breeze to an easy first round win. Tennessee raced out to a 9-0 lead and had an 11-2 lead after the opening three and a half minutes. But when Admiral Schofield missed a transition dunk, Colgate saw an opportunity to turn the tide, and they did. The Raiders went on a quick 6-0 run to cut UT’s lead to 11-8, and they hung around for the next few minutes of game time and had cut Tennessee’s lead to 20-18 with 8:17 to go. Then the Vols went on a 6-0 run in a matter of 20 seconds when Grant Williams hit a bucket inside, Jordan Bone got a layup on a fastbreak, and Lamonte Turner made a heads up play by stealing the inbounds pass and getting an easy basket under the bucket. At that point, the Vols led 26-18, and they would end up taking a 31-20 lead moments later and stay ahead by double digits for the remainder of the first half. Tennessee led 42-30 at halftime, and they forced eight Raider turnovers in the first half of play compared to turning it over just four times themselves. But then, Colgate got hot to start the second half. The Raiders opened up the half shooting lights out from three, and they erased the halftime deficit and took a 52-50 lead with 11:35 to go in the game. From that point on, though, Tennessee started playing better on defense and played more within themselves on offense. UT went on a 6-0 run to grab a four-point lead, and they got it up to a six-point lead with 4:01 to go when Admiral Schofield drained a three. Colgate got the lead back down to three with 1:59 to go on a Jordan Burns jumper, but Tennessee immediately responded with another Schofield triple. After that, Tennessee iced the game away. Schofield hit two corner threes late in the game to give the Vols a six-point lead then drove home the dagger to make it a 73-64 game with 45.6 seconds to go in the game. Both he and Bone made free throws down the stretch and clinched the victory for UT. Here are our five biggest takeaways from Tennessee’s 77-70 win over Colgate. Jordan Burns was absolutely on fire on Friday afternoon. The sophomore guard came in to Friday’s game as Colgate’s second-leading scorer and earned Second-Team All-Patriot League honors this season. He averaged 15.8 points per game and was connecting on 37.8 percent of his threes for the season. On Friday, he surpassed all of those stats. Burns put up 32 points against the Vols, and he drained eight of his 13 three-pointers. Luckily for Tennessee, he didn’t stay as hot from three as he started out the game. He connected on six of his first seven shots from distance, but he ended up missing four of his final six attempts from three to close out the game. Still, Burns was easily the biggest problem for the Vols. It wasn’t like Burns was getting a bunch of uncontested jumpers, though. A lot of times, he had a hand in his face or a Vol right near him as he shot. He was just unconscious from distance. The one thing that hurt him and Colgate as a whole was turnovers, though. Burns had four assists in the game, but he turned the ball over six times. The Raiders as a whole turned it over 13 times compared to eight turnovers by the Vols. Burns had 45.7 percent of Colgate’s points on the afternoon. He was 12-of-20 (60.0 percent) from the floor, but the rest of the team was 13-of-36 (36.1 percent) for the game. Colgate’s Patriot League Player of the Year was a non-factor because of an eye issue, and Tennessee’s two-time SEC Player of the Year was frustrated and contained for most of the game. Rapolas Ivanauskas only played 16 minutes and sat out for the vast majority of the second half after his contacts messed up and he had vision issues. He didn’t score and was 0-of-4 from the field, pulling down three rebounds. After he sat out, Colgate just started firing threes in the second half and kept making them. Tennessee weathered that storm, but they did so without Grant Williams being a big factor. The Raiders did a good job of doubling Williams and taking him out of his comfort zone. He only attempted six field goals and finished with nine points and seven rebounds. He did dish out three assists, but he also turned the ball over twice. He also had a shot blocked in the paint by one of Colgate’s players. It wasn’t a good day to be a conference Player of the Year on Friday afternoon. For Tennessee, their support players came up huge on Friday. Admiral Schofield finally got hot late in the game and scored 12 of his 19 points in the final four minutes. But before he did that, the Vols got a lot of help from their guards. Jordan Bowden finished with 14 points and was 6-for-10 on his field goal attempts. He also had four rebounds and played some good defense, swatting a ball away and saving the Vols from giving up another two points late in the second half. Lamonte Turner wasn’t extremely efficient, but he had 13 points on 5-of-12 shooting. Where he really stood out, though, was as a distributor. He finished with six assists and zero turnovers. Jordan Bone had 16 points, five rebounds, and three assists in 34 minutes of play. He was 6-of-15 from the floor and made some great defensive plays, including a clutch steal and bucket in the second half. Even John Fulkerson played some solid minutes. He had to play more than expected because Williams picked up three fouls in the second half, and he did well both on defense and offense. He finished with four points, four rebounds, a block, and a steal in 12 minutes. Tennessee needed their other players other than Williams and Schofield to have good games and keep them afloat, and they did just that until Admiral finally caught fire late. Colgate was solid in the paint and did a good job of denying entry passes and frustrating Tennessee’s post players. Because of that and UT’s players getting some confidence early in their jump-shooting ability, the Vols played less aggressive than they should have. Tennessee shot 26 three-pointers and only attempted 11 free throws on the afternoon. It wasn’t until the final few seconds when Colgate was in “must foul” mode where the Vols eclipsed double-digits in free throw attempts. The Vols were 9-of-26 from three and 8-of-11 from the free throw line. The Raiders had to shoot a lot of threes because of Ivanauskas’ absence. That, and they were connecting on a lot of them. But they only attempted three more treys than Tennessee, but they made six more of them than the Vols did. UT did outscore Colgate 38-20 in the paint, but a lot of that was from guards cutting to the basket or points in transition. The Vols had 10 fastbreak points, but the Raiders pulled down 31 rebounds compared to 35 by Tennessee. By the way, Friday’s game marked the second-straight game that Tennessee has allowed 15 makes from three to an opponent. Last time, it resulted in an 84-64 loss to Auburn in the SEC Tournament Finals. This time, the Vols were able to pull out a 77-70 win. Once again, the Vols didn’t play their brand of basketball. It didn’t cost them this time, but it has in the past and could again in the future. Up next, the Vols have to face another tough three-point shooting opponent. No. 10 seed Iowa upset No. 7 seed Cincinnati in the game before Tennessee’s, and that’s who the Vols will have to face on Sunday. The Hawkeyes made 11 of their 22 threes against the Bearcats, and they’ve made 36.5 percent of their threes this season. Not only that, but Iowa plays with the 82nd-fastest tempo in college basketball according to Ken Pomeroy’s statistics. Four of Tennessee’s five losses this season have come to teams in the top 170 in tempo.